This weekend marks the transition from summer to fall in the Northern Hemisphere, and viewers around the world can watch a special webcast Friday (Sept. 21) to celebrate the event. The online Slooh Space Camera, which broadcasts live views from telescopes around the world, will stream shots of the sun Friday beginning at 4 p.m. EDT (2000 GMT). 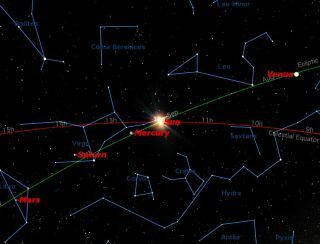 The free show is in honor of the September equinox, which on Saturday (Sept. 22) rings in the Northern autumn and the Southern spring. The webcast can be accessed at the Slooh Space Camera's website. Moon-viewing parties will be held at multiple sites around the world on Saturday. To find one near you, visit http://observethemoonnight.org/.